To Cite: Zabihzadeh M, Karami V. Current Status of the Fetography: Preventing of the Future Radiation Induced Cancer, Int J Cancer Manag. 2017 ; 10(1):e5209. doi: 10.17795/ijcp-5209. Background: Fetography has named the radiography of the fetus in utero. Due to the potential risk of radiation-induced cancers and other malignant effects, this procedure has avoided and has completely replaced by ultrasonography. However it has observed that this invasive procedure has still followed in some clinical departments. Objectives: The aim of this study was to assess the current status of the fetography and its prevalence as an un-recommended diagnostic procedure in teaching hospitals of Ahvaz, Iran. Methods: The radiology and ultrasonography reception systems of two teaching hospitals of Ahvaz have investigated to identify pregnant patients who has undergone fetal presentation imaging (cephalic or breech) between 21 March 2013 and 21 March 2015. Results: In general 3741 pregnant women who have undergone fetal-presentation imaging during two past years have identified. There was significant statistically differences between X-ray and ultrasonography examinations (2528 vs. 1213; P value < 0.05), as those have accounted for 67.5% and 32.5% of the performed examinations, respectively. Women younger than 30 years, who were more sensitive to radiation, accounted for 51.2% of the X-ray examinations. The number of fetographies has increased as much as 2.2 fold during 2013 to 2015. Discussion: Women of the investigated hospital have received avoidable fetal irradiation due to fetography then it was a reason for concern. Ultrasonography should be the first-line imaging modality for pregnant women, especially in the case of fetal-presentation. The carcinogenesis and malignant effects of ionizing radiation have well established (1). A human fetus would be highly sensitive to the effects of radiation due to its rapid proliferation (2). The sensitivity of the fetes to radiation induced cancer was10 times more than adults (3). The major biological effects of fetus irradiation were fetal death, congenital malformation, mental and intrauterine growth retardation, mutagenic effects and mainly induction of cancers such as childhood leukemia (4, 5). Accordingly, the X-ray imaging of pregnant women was a unique challenge for expectant mothers and physicians (4). According to as low as reasonably achievable (ALARA) principle, the benefits of any X-ray exposure should balance with the cost and the risk to the patient (2). Due to the potential cancer risk associated with fetal irradiation, consideration should give to the use of other imaging modalities that involve non-ionizing radiation such as ultrasound, to address the clinical problem (4, 6). Accordingly X-ray exposure of the pregnant women has justified only when clinical problem cannot be addressing in other way (6). Fetography has known as radiography of the fetus in utero that past decades has employed to confirm suspected fetal death, determination of the single or multiple pregnancies and routinely to determine fetal presentation (cephalic or breech). Due to the potential risk of radiation-induced cancers and other malignant effects, this procedure has avoided and completely replaced by ultrasonography. Many reference radiographic technique books have also advocated these statements (6). Inspite of all recommendations to prevent fetography, unfortunately it has observed that this invasive procedure currently has still followed in some clinical departments. To the best of our knowledge there was no exactly data on the frequency of fetography as an un-recommended diagnostic procedure. The aim of this study was to assess the current status of the fetography and its frequency as an un-recommended diagnostic procedure in hospitals supervised with Ahvaz Jundishapur University of Medical Sciences (AJUMS). A retrospective cross sectional study has performed in teaching hospitals of Ahvaz-Iran. This was a regional provincial capital in the south-west of Iran. The ethical committee of AJUMS has approved the concept of this study (Ref. No. IR.AJUMS.REC.1394.511). The privacy of patients has respected. After preliminary coordination, the radiology and ultrasonography reception systems of three teaching hospitals of Ahvaz (with maternity department) have investigated to identify pregnant women who undergone fetal imaging (ultrasonography and X-ray) between 21 March 2013 and 21 March 2015. Due to practical limitations, data acquisition was feasible only from two hospitals and all available data have included in this study. Patients have considered eligible for inclusion if they have undergone fetal presentation imaging in order to determine whether the pregnancy is cephalic or breech. All patients that have not met our inclusion criteria have excluded of the study. The contribution of X-ray and ultrasound in fetal-presentation imaging has investigated. 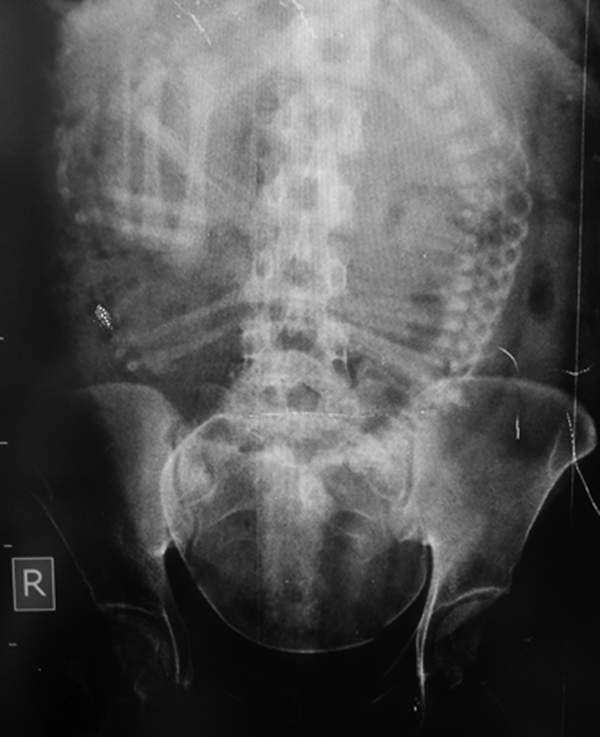 A sample of the fetography has performed in hospital “A” in order to whether the pregnancy was cephalic or breech, has shown in Figure 1. Z-test has used to assess significant difference between X-ray and ultrasonography examinations. SPSS version 15 has used as statistical tools (IBM Corporation, New York, United States of America). P-value less than 0.05 have considered statistically significant. From databases of reception systems of two investigated hospitals, 3741 pregnant women who have undergone fetal-presentation imaging between 21 March 2013 and 21 March 2015 have identified of which 7 patients (5 X-ray and 2 ultrasound) have duplicated. When of radiographers asked the reason for duplicated patients, the reimaging due to mistake to predict of childbirth time have proposed. From our results, there was significant statistically differences between X-ray and ultrasonography examinations (2528 vs. 1213; P value < 0.05), as those have accounted for 67.5% and 32.5% of the performed examinations, respectively. This fact has meant that prevalence of fetography as un-recommended imaging procedure was about 2 times greater than recommended ultrasonography examination. Between 2013 and 2015 the number of fetographies has increased as much as 2.2 fold (from 790 to 1738), while ultrasonography examinations had small growth (from 562 to 651). It has found that women younger than 30 years, who were more sensitive to radiation, accounted for 51.2% of the X-ray examinations. Also fetography was more commonly in hospital A than B (1737 vs. 791; P value < 0.05). Details of the study have shown in Table 1. This study has evaluated the status of the fetography in 3741 pregnant woman. The epidemiological evidence for radiation carcinogenesis mainly stem from studies on women who have undergone abdomen and pelvic irradiation (7). These studies have linked between the low dose of ionizing radiation and increasing rate of childhood cancer and leukemia (8-10). Unborn babies have particularly been sensitive to the cancer-causing effects of radiation. Bailey et al. (11) has stated that “diagnostic irradiation of the mother during pregnancy increased the risk of childhood acute lymphoblastic leukemia”. According to results of this study X-ray have accounted for 67.5% of the performed examinations. This was of particular concerns due to fetography responsible for the highest fetal radiation dose than any radiographic procedures; due to it has associated with high exposure factors (Figure 1). The mean fetus radiation dose from anteroposterior (AP) projection of the abdomen or pelvis radiography has estimated in the range of 1.1 - 4 mGy (4, 7), which depended on patient's girth that was typically late in the end time of the pregnancy. McCollough et al. (4) has reported that the fetal radiation dose due to limited intravenous pyelography (IVP) of the pregnant women increased up to 7 fold with increasing patient’s thickness from 21 to 33 cm. Fetography pose at least two-fold problem; not only fetus has been at risk for radiation induced cancer; the mothers were also at risk due to both the somatic and hereditary effects of ionizing radiation. The results of this study has concerned as the number of the fetographies have increased up to 2.2 fold during past two years. Although the individual risk of developing radiation-induced cancer following fetography was relatively low, but due to increasing the number of patients undergoing X-ray examinations, as well as reports of a substantial fraction of patients undergoing multiple and repeated X-ray examinations (12, 13), the cumulative dose and following radiation risk could be significant. Therefore it was essential that followed a safety guideline for imaging of the pregnant women. Ultrasonography has been inexpensive, available that provided visualization of the fetus without the risk to the both mothers and fetus. Therefore it should consider as the preferred way to addressing fetal-presentation. It should emphasize that fetography has avoided and has completely been replaced by ultrasonography unless there was a strong clinical indication for its application (6). Although this study has carried out in two hospitals of Ahvaz and might not be apply in country; nonetheless it has identified some areas of concern: The number of feographies has increased and also it might be a nationwide. To confirm our suspicion, a comprehensive nationwide study might require. First, in one hospital both the fetography and supine abdominopelvic X-ray examinations have recorded by same reception code and have excluded from the study. Secondly, in two hospitals that have included in the current study both the fetography and supine abdominopelvic X-ray examinations have recorded by same reception code before March 2013. Therefore we could not assess the number of performed fetographies before 2013. Women of the investigated hospitals have received avoidable fetal irradiation due to fetography and it was a reason for concern. Ultrasonography should be the first-line imaging modality for pregnant women, especially in the case of fetal-presentation. We have been grateful of the heads of reception system of the investigated hospitals for their kindly cooperation. Authors’ Contributions: Study concept and design, collecting data and drafting of the manuscript: Vahid Karami. Analysis and interpretation of data, critical revision of the manuscript for important intellectual content as well as statistical analysis: Vahid Karami, and Mansour Zabihzadeh. Conflicts of Interest: There was no conflict.